Is your house without a chimney? You can still have a beautiful fire. To finish off the look, why not treat yourself to a bespoke fire surround? Available to suit all your requirements. We are proud to be stockists of Gazco Stainless Steel Concentric Flue Systems for balanced flue fires and stoves. Winter is just around the corner and there is no time like the present to start thinking about keeping warm. Having a chimney is not always a necessity to have a gas fire, so if you think you can’t have one because you don’t have a chimney, think again! We have the answer, From woodburners to open fires there is always a solution. If you would like to know more, please do not hesitate to contact us today. 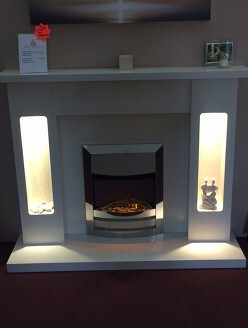 Here at Select Fireplace & Stove Company we have our very own fitting team onsite, there is no contractors and fitting is all done by full qualiified Gas Safe technicians so you can also relax knowing that an expert has installed it for you. We are a family run business and have over 30 years of experience so if you have any queries about our twinwall or flexi liner, please do not hesitate to contact us today.